Easy access and pleasant winter temps make Pilot one of the most popular crags in the state, particularly during cooler days. It can get hot here in the summer. From Winston Salem, follow Highway 52 North. Look for signs for Pilot Mountain State park. Take that exit, turn left and follow the signs to the park entrance just down the road on the left. Follow the park road all the way to the top and park in the back of the parking area near the overlook to be closest to the trail. Register at the kiosk and follow the Ledge Springs trail down into the woods. The most common descent is at the Three Bears Gully (there is now a sign that marks this descent), use caution on the descent, it can be slippery at the top. The gully puts you at the Three Bears / Any Major Dude area, the Amphitheater is to climber's right from here and Eight Ball is to climber's left. Primarily sport climbs on quartzite rock ranging from slabs to roofs. 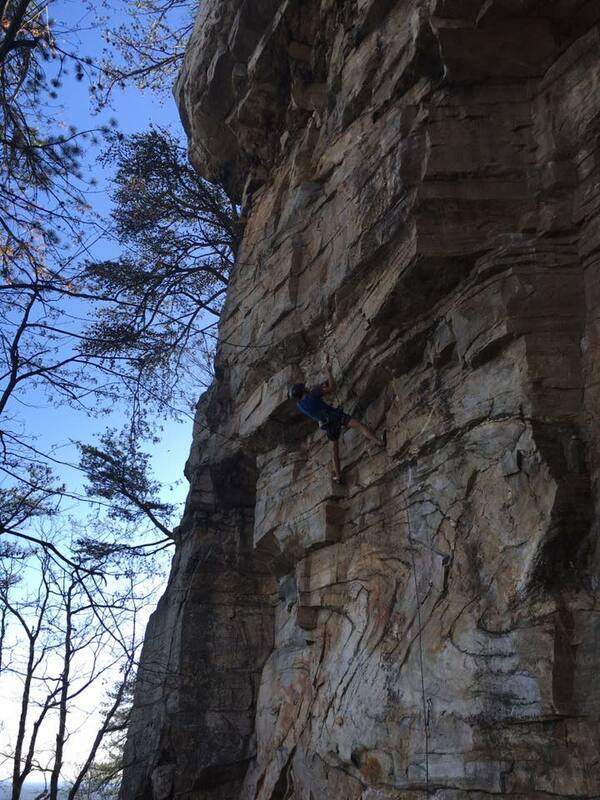 Primarily face climbing, with a few crack moves thrown in from time to time. Top ropes are easy to set up, please do not use trees for top rope anchors there are new bolted stations at the top of just about every climb. All routes can be climbed with a 60m rope. Use caution as there have been problems with people throwing rocks and other objects from the top of the cliff. Camping is available in Pilot Mountain State Park. Please make sure to descend via the 3 Bears Gulley (look for the sign) and be considerate of others, particularly non-climbers, and don't block the trail at the base with gear. Do not set up anchors of off trees or other vegetation. Be sure to fill out a permit at the kiosk in the parking lot. Read more about why the big pinnacle is closed to climbing here. In addition to the free guide available above, routes at Pilot are covered in Carolina Rocks - the Piedmont.